This month’s featured photographer is Daniel Guzmics. “This picture was taken in June 2016. I was at Samdach Sothearos Blvd, next to the Royal Palace in Phnom Penh, Cambodia,” says Guzmics. “Unfortunately, the viewer cannot see the Royal Palace with its golden roof. 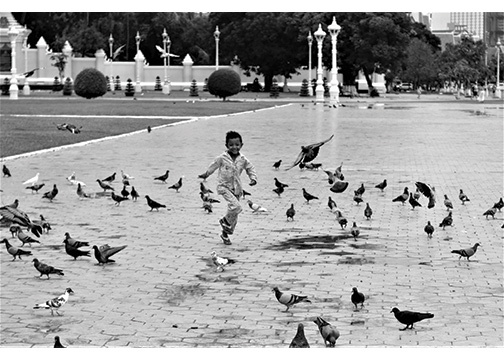 However, seeing this young boy, with his ragged clothes, so happy in front of the golden palace and an enormous portrait of Cambodia’s king made me really happy.